With my design worked out and my fabric sorted, it was time to drape a pattern for my tea gown. First though, I had to figure out how it was going to go together and fasten. After confusing you all by asking how you thought the one on the left got put on (that’s easy – under the flap on the PL front) when I meant the right, and getting every possible suggestion on how it might go together, (my favourite being “drink the bottle labelled ‘drink me’, shrink to size, climb into the dress, and then eat the cookie labelled ‘eat me’ and grown until you fit it again”) I decided on what I thought was the most likely historically-accurate option. 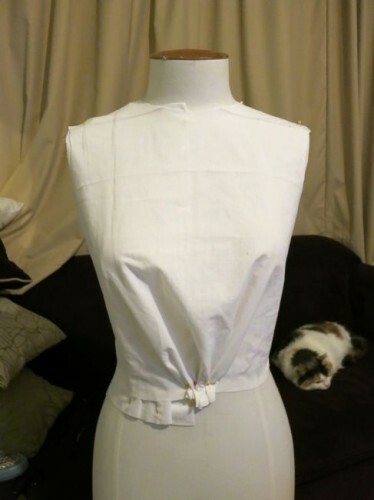 My tea gown will have a basic bodice support which will fasten up the centre front with hooks. The lace overbodice will be sew into the gown on one side, and will wrap over the bodice support and fasten on the other side with hooks, just under the edge of the over robe. This is a very common construction technique in turn-of-the-century garments, you can see a similar example (though not a tea gown) here. The strong under-structure will support the weight of the robe, and the lace over-bodice will hide all the fastenings. 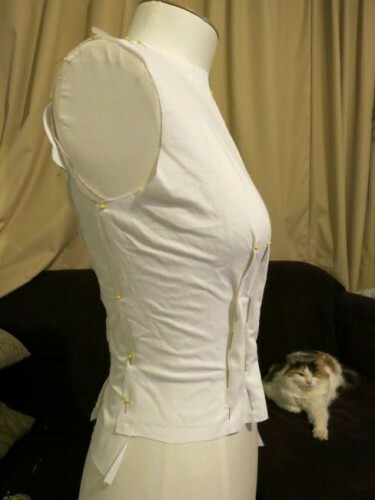 The petticoat/skirt will be a separate piece, and the sash will hide the join of the two garments. Is this accurate? I think so. It matches what is shown in fashion plates, it matches what I can see of extent garments, and it fills the essential tea-gown requirement that it be put-on-able with minimal help. What about that separate petticoat? I’ve read of tea gowns that were in two parts, with a skirt/petticoat, and a separate bodice with attached robe. Constructing my tea gown in this way has two massive advantages (besides historical probability). It makes putting the outfit on and fastening it very simple (put the skirt on, then the bodice, no tricky reaching around behind under the robe to do the skirt), and it means there is a possibility that I could make an evening bodice to go with the skirt later, thus getting the maximum use from my sewing time and the fabric. 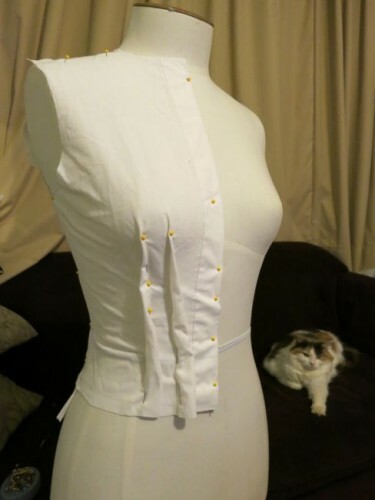 Making an evening bodice and a tea gown at the same time probably isn’t historically accurate, or at least I know of no extent examples where this is done, but re-making garments is very historically accurate. 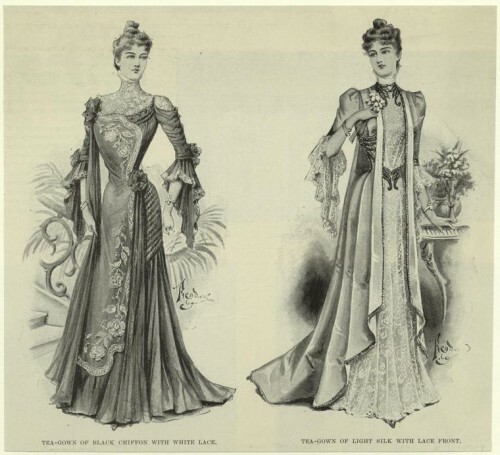 It is entirely probably that there were women who had tea gowns made of sumptuous fabric converted into an evening wear after a few years of wear as a tea gown. I’ll just be compressing the process. Right! Thinking done, time for some draping. 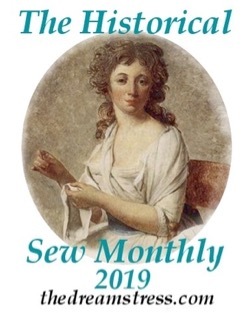 First I draped the under-bodice, basing my seamlines and general shape on extent garments I have studied (alas, no tea gowns) and patterns in Janet Arnold. 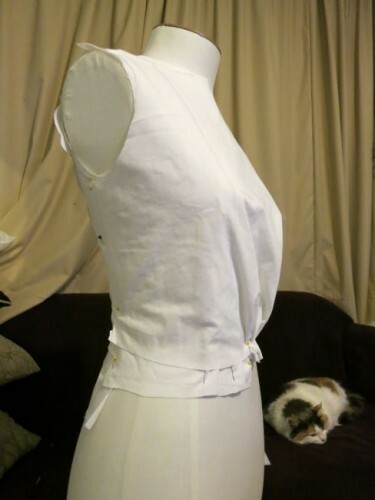 I started out draping a high neckline, and cut it down later. You can see that I draped it right over my under-drapings. That helped me get all the neck and sleeve lines to match up. Felicity found the whole process quite boring, but she was aware that she made the pictures more interesting. So, drapings done, time to toile them up and see how they fit! Yes, it’s brilliant isn’t it? I’ve actually seen some with four overlapping layers of closure – you can hardly figure out how to get in. Pancake cat? It’s not a term I’m familiar with. Is that because she has spread out like batter and is flatter than she is tall? And I’m quite used to Felicity stealing the spotlight! Very interesting! 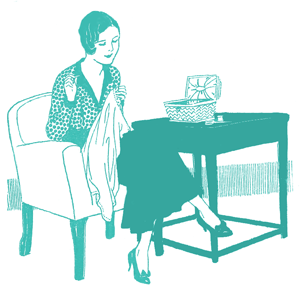 And I have to admit pangs of envy – I never did manage to get a dress form that was the same shape and measurements as I was. 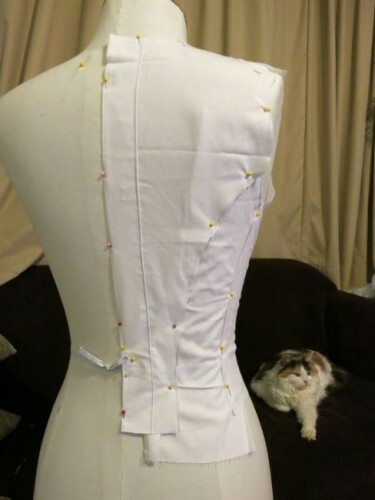 My efforts involved my draping bits on myself – very tricky. My dress form was okay for getting the drape right, but after that it was a display thing. Felicity, as usual, looks beautiful! 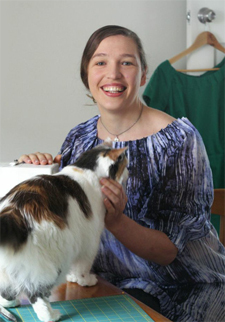 They had a couple of posts on jezebel.com about making your dress form just for you. Felicity stole the show for me. 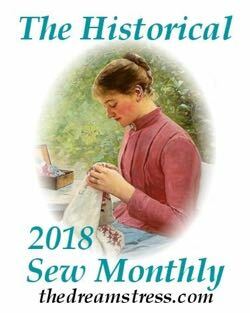 Looking forward to seeing the finished tea gown. If only we all had occasion to wear one these days. I really need to get my A into G and make a dress form. Don’t especially want to do it at the moment though, because my measurements keep changing. Next PostSwiss waist, waist cincher, corset, and corselet: what’s the difference?